I wish I could turn the clock back to when my dad used to carve the turkey with an electric knife and my whole family spent the holiday around a table literally covered with platters of stuffing and green beans and bowls of cranberry sauce and shimmering, neon jello. My father was not only an expert carver and server (being an architect helped) but also a sports lover. His go-to teams were the Knicks and the Yankees and he was glued to the games on our rec room TV. Went he wasn’t tuning into games, he was chairing zoning board meetings and talking Teaneck politics, because his love of our home town was as palpable as his love of family. So, back to that frosty Thanksgiving in 1984 around a warm, aromatic holiday table, with about a dozen of us busily digging into our piles of white and dark meat and stuffing when the doorbell rang. DING-DONG. DING-DONG. None of us could figure out who would show up at the front door in the middle of a festive meal. 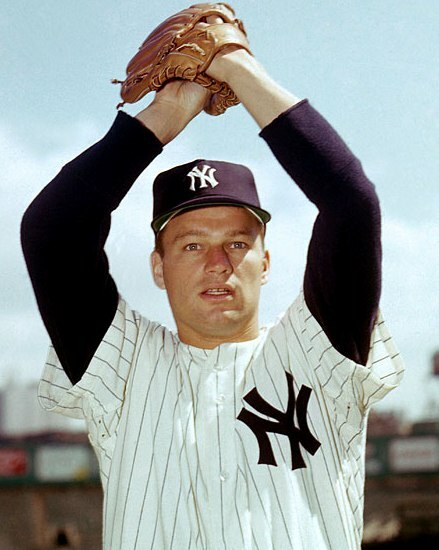 My dad went to answer, and who’s at the door, but none other than ex-Yankee Jim Bouton. My dad was floored and waved Bouton into (our) home. It seems my sister, who worked for Burger King Corporation at the time, met Bouton when he was a spokesman for the burger brand, told him that we also lived in Teaneck, and gave him an open invite to our house. And, whaddya know, he took us up on it. Bouton quickly made himself at home and tucked into the food. He didn’t talk much about baseball or Ball Four, his diary about locker room and post-locker room action that was a controversial bestseller back in 1970, but he did talk about his love for our home town. Maybe he was tired of talking about his championship season or late career knuckleball. Or, maybe, just maybe, he wanted to eat some good food with neighbors who loved the hood as much as he did. In any event, this was a Yankee Thanksgiving that none of us would ever forget.